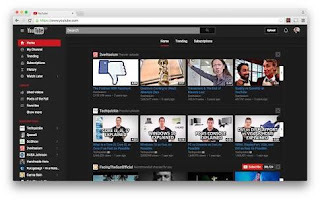 YouTube, a video viewing platform of Google has launched an update that will enable users watch videos on the site via its YouTube dark mode. 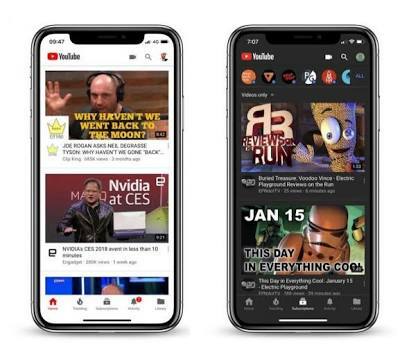 This YouTube Dark mode feature is already enabled in desktops and laptops and recently, Google made the dark mode available to viewers who use devices that run on iOS. The dark mode will soon be experienced by Android users, although the release time has not been made known. For iOS users who wish to view YouTube videos on the YouTube dark mode; launch the YouTube app and tap your account icon in the top-right corner. Tap on Settings and then toggle on Dark theme. Don't miss » COOL? AN APP THAT GIVES YOU INFORMATION ABOUT ALL KINDS OF OBJECTS WHEN YOU POINT YOUR SMARTPHONE'S CAMERA AT THEM (PHOTOS). Just like the iOS YouTube's Mobile App, you can activate the dark theme or dark mode on desktops and laptops by clicking your account icon in the top-right, click the Dark theme line directly above Settings and then click the toggle switch to turn on Dark theme. You can always disable this feature in future by toggling it off. PremiumsTech is a Tech blog that shares Tech News, Top technology products Rating, Tech reviews, How-To, Robot and Artificial intelligence Contents, Science and Discoveries, Tech videos, Tech guides and tips, E-Business, Google and Bing related posts, Microsoft, Smartphone, Software, Apple, iPhone and iPad, Samsung products, Mobile Phone Tips, Health Tips, Internet/Online Security Tips, Software and App Tweaks. The blog also provide articles and tutorials that solve problems on Android operating system, iOS iPhone, smartphone update, Social media Networks like (Facebook, Twitter, instagram, Whatsapp, Snap chat, etc), Mobile phone Specs, Movie & TV Apps, Laptop/PC Softwares, Windows Operating system, Linux, MAC, Android and iPhone hacks, iPads and iPods, computer repairs and settings.